Our new book. That's right we wrote a book. Well if we can blog then we can write. Rose the Irish Setter and Kate the English Springer Spaniel, best friends for more than a decade, discovered several years ago that they had an amazing talent: they can blog. 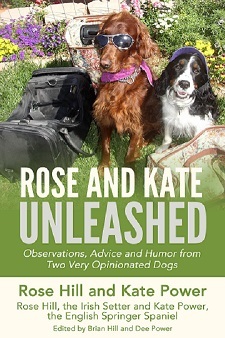 Since then, they have been writing down their observations, experiences and fun times and now they are ready to share them with you in their brand new Ebook, Rose and Kate Unleashed"Edited by Brian Hill and Dee Power. Oh, we have a blog Yup, me and Rose (this is Kate talking now) have our own dogs blog We can't post every day, it's hard when you've just got paws but we will be posting. If you go right below our photos on the graphic at the top of the page you can find the different sections of our website. I like the one about healthy healthy homemade dog food the best but I think Kate likes the squeaky dog toys. She plays a lot. Kate likes toys and I do too. Kate plays and I nap. Big girls like me need a lot of naps. Dogs Rule We've picked out our favorite stuff for you. There's articles and reports, even a free one below. You can find tips on dog supplies and dog training (they made us put that one in), fun stuff, even recipes for yummy treats. We go almost every place our two legged companions go. We went camping this summer at the lake that was soooo much fun. We stayed in a nice cabin that had a fireplace and kitchen. Kitchens are a very important part of a cabin 'cause that's where our two legged companions make our breakfast and dinner. They think dogs rule too. Some Puppies aren't as lucky as we are. Our two legged companions take really good care of us. Lots of toys, play time, just enough food, and cuddles. We also go to the vet for checkups. There are dogs looking for good homes so if you're thinking about getting a dog please think about getting rescue dog. You can find rescue dogs at humane societies and rescue organizations. Are you thinking about getting a canine companion? Different Dog Breeds have different requirements. And some of them might surprise you. Big dogs can often live happily in apartments with a couple of daily walks because they're just not as active as a terrier for example, even though they're little they require exercise. Me and Rose couldn't live in an apartment unless we went for lots and lots of walks.